Gordon attended Lamar High School in Houston, Texas, where he played football, basketball and ran track. He played basketball as a sophomore. In football, he caught 20 passes for 363 yards and four touchdowns as a junior. As a senior, he was named first-team All-District 20-5A after totaling 25 receptions for 531 yards (21.2 average) and nine touchdowns. "Baylor Football Commitments". Rivals.com. Retrieved 2012-07-12. "2009 Baylor Football Commits". Scout.com. Retrieved 2012-07-12. "Scout.com Team Recruiting Rankings". Scout.com. Retrieved 2012-07-12. "2009 Team Ranking". Rivals.com. Retrieved 2012-07-12. On June 7, 2013, the NFL announced that Gordon would be suspended for the first two games of the 2013 season due to violating the NFL's substance-abuse policy. During Week 12, Gordon had 237 receiving yards and in Week 13, 261 yards. It marked the first time in NFL history a wide receiver had back-to-back 200-yard receiving games. On December 26, 2013, He was named the Cleveland Chapter PFWA Player of the Year following the season. On December 27, 2013, Gordon was voted to his first Pro Bowl selection. Gordon finished the 2013 season as the NFL's leader in receiving yards, with 1,646 yards and was named First-Team All-Pro alongside Calvin Johnson of the Detroit Lions. Gordon was suspended for the entire 2015 season due to violating the league's substance abuse policy. In January 2015, Gordon faced another year-long suspension due to testing positive for alcohol use. Gordon entered the NFL's substance abuse program after pleading guilty to a driving while impaired charge in September 2014 and was prohibited from consuming alcohol during his time in the program. Gordon was officially suspended for one year on February 3, 2015 and wasn't eligible to return until the start of the 2016 season. On January 20, 2016, Gordon applied to the league for reinstatement. His request was denied in March when it was reported that he'd failed another drug test. On July 25, 2016, Gordon was reinstated by the NFL. He was allowed to participate in training camp but was suspended for the first 4 games of the regular season. ↑ "Josh Gordon Pro Football Reference Profile". pro-football-reference.com. ↑ "Josh Gordon". Scout.com. Retrieved July 13, 2012. ↑ "Josh Gordon". Rivals.com. Retrieved 13 July 2012. 1 2 3 McClain, John (July 12, 2012). 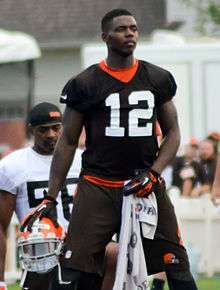 "Former Baylor WR Josh Gordon hopes to leave his past behind him". Houston Chronicle. Retrieved July 13, 2012. 1 2 3 "Receiver-starved Browns gamble on Josh Gordon in Supplemental Draft". Sports Illustrated. July 12, 2012. Retrieved July 13, 2012. ↑ Davis, Nate (July 12, 2012). "Browns select ex-Baylor WR Josh Gordon in supplemental draft". USA Today. Retrieved July 13, 2012. ↑ Schefter, Adam (July 12, 2012). "Browns take Josh Gordon in Round 2". ESPN. Retrieved July 13, 2012. ↑ Kay, Joe (June 7, 2013). "Browns WR Josh Gordon suspended for 2 games". Yahoo! Sports. Retrieved June 7, 2013. ↑ "Gordon, Thomas honored by PFWA". clevelandbrowns.com. Retrieved December 26, 2013. ↑ Jones, Lindsay (July 5, 2014). "Browns wide receiver Josh Gordon arrested for DWI". USA Today. Retrieved July 7, 2014. ↑ "Josh Gordon suspended 1 year". ESPN. August 26, 2014. Retrieved August 26, 2014. ↑ "Browns' Josh Gordon reinstated from suspension". NFL.com. November 17, 2014. Retrieved November 17, 2014. ↑ "Josh Gordon suspended by Cleveland Browns". NFL.com. December 27, 2014. Retrieved December 27, 2014. ↑ Wesseling, Chris (February 3, 2015). "Browns' Josh Gordon suspended at least 1 year by NFL". NFL.com. Retrieved March 25, 2016. ↑ "Josh Gordon facing 1-year ban". ESPN.com. January 25, 2015. Retrieved January 25, 2015. ↑ "Josh Gordon fails another substance abuse test, faces 1-year suspension, per report". SB Nation. January 25, 2015. Retrieved January 25, 2015. ↑ "Sources: Josh Gordon fails another NFL-administered drug test". Fox Sports. 2016-11-15. Retrieved 2016-07-19. ↑ "NFL reinstates Josh Gordon from suspension on conditional basis". ESPN.com. ↑ "Browns wideout Josh Gordon entering rehab facility". NFL.com.